Oil is not trading overly happy today. 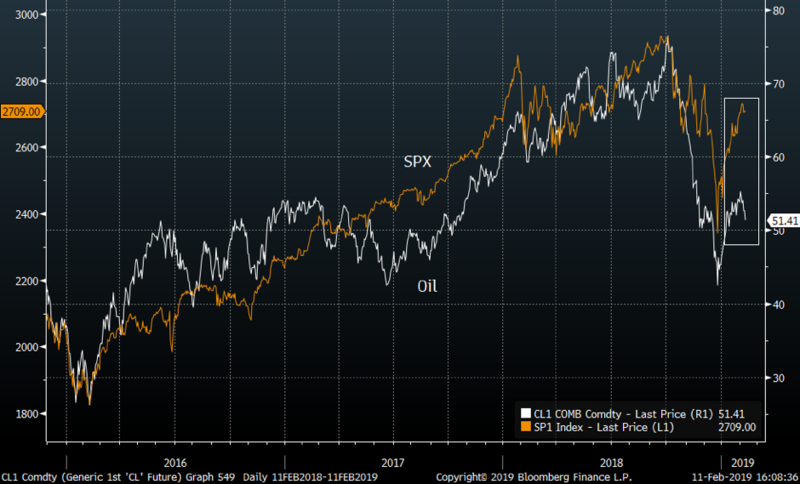 A week ago, most people saw oil about to break up higher, as equities showed the way, but since the reversal around the 55 level, oil continues losing momentum. First stop is the 50-day average and then the 50 area. The DXY index is not helping oil (nor gold). Having bounced on the 200-day average, the DXY continues trading strong. In our view the DXY trades in a consolidation, and we should probably see another reversal at recent highs, but for now the momentum is strong. Most people have forgot the sharp oil moves during the autumn. Back then oil managed to “guide” equities, and the two bounced in tandem. Recently the gap between the two assets has started getting a bit too extreme for us to be calm. Watch oil and oil volatility (OIV) closely here, as it could start spilling over to equities.